Admit it, if it wasn’t for the holidays and snowball fights winter is a boring season. This winter has just been a cold and mostly snowless void, and with the holidays over winter has no reason to still be here. In my quest to cure myself of the wintertime blues I called on a few friends and channeled the spirits of springtime future and roused myself from this long winters nap. Just as the approaching tide of fall and winter bring back classic dishes to my table, coq au vin and Cassoulet for example, spring screams for meals with the flame broiled taste of the grill. With our coals glowing our team was ready to introduce the world to a seasonal sensation of “grilled flatbreads”;, grilled pita spread with a savory goat cheese Alfredo topped with balsamic caramelized onions, grilled pineapple, fire torched oranges and finished with wilted arugula. The finishing touch of the wilted arugula provided a peppery bite to round out the party of flavors. While we were grilling the cold winds cut through our clothes, demanding that we abandon our quest for spring and send us back inside to hibernate. We fought on, but required something warm and rich to enhance our strength! That’s when we created our new grilled cauliflower soup. We grilled thick cut slabs of cauliflower seasoned with salt and cracked black pepper till they were just tender with hints of smoke and char from the flames. To make the soup we used one of our greatest secret ingredients, smoked beef butter which adds a slight kick of smoke and body to our dish. We sweated onions, thyme, and garlic till tender then added our cauliflower and stock. A trip to the blender and we had a velvety smooth concoction with hints of smoke and BBQ, but there was something missing, something to add that element of spring to the dish. Puttanesca sauce or charmoula grilled shrimp were the answer. Both add a spice and texture so different from the soup, while the vinegar in the puttanesca and the lime/lemon juice in the shrimp cut through the richness and left the soup light and delicious. With our grill dying down we still had the urge for something more, a dish that truly represented the essence of spring, but what could that be? A fresh tomato tart! But not just any tart, we changed up the rules and developed a hot bacon, lettuce and tomato tart with house cured pancetta, hot house tomatoes, wilted arugula, smoked herbed goat cheese and finished it with lemon zest. We used a combination of extra virgin olive oil, balsamic vinegar, sherry vinegar, summer savory, basil and homemade red chili flakes. This went into our skillet with the halved tomatoes and crispy pancetta then topped with a sheet of puff pastry and into the oven to work magic. We watched as our pastry crust slowly rose becoming crispy and golden as the tomatoes beneath wilted into the crust. When all was ready we flipped the tart onto a plate then topped with smoked herbed goat cheese, fresh lemon zest and wilted arugula. Ripe and tender tomatoes, yielding like a rich sauce to your fork with crispy flavor bombs of pancetta draped with the light smoke from the goat cheese was finished off by the peppery bite of the arugula. I can almost feel that spring time air with each and every bite. While we still have a couple more months of winter left to battle, at least I can rest assured knowing come springtime we will be ready with some of your new favorite inspired occasion’s creations. Stay tuned for more inspired dishes from Lon Lane's Inspired Occasions Research and Development Department! It’s that time of year again. College football has just ended and the big showcase is looming around the corner. The Feast of the Super Bowl is one of my favorite holidays every year, bringing together friends and family to eat way too much, drink ice cold beer and shout at a television for hours on a Sunday afternoon. But like any great tradition, doing the same old same old every year can become dull and vapid. 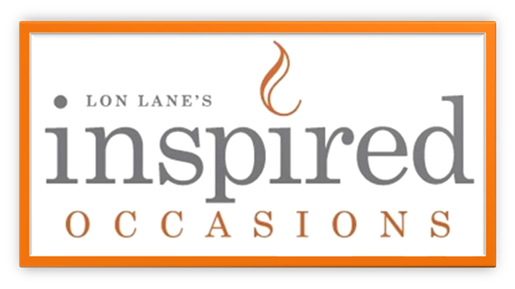 So this year we here at Lon Lane’s Inspired Occasions decided to “Tackle the Challenge” “kick off” some game day dishes destined for the highlight reel. Buffalo wings. Over the years we have seen the evolution of this incredible dish, from humble bar snacks to the fodder of the finest gastro pubs. But at their heart they are a simplistic combination of tender chicken in a rich and powerful sauce. So why then does the form matter? Introducing a duo of Buffy chicken goodness, our new buffalo chicken torte layered with ranch cream cheese and diced celery and carrots. We made a batch of deeply seasoned and marinated chicken strips; hand chopped them and then tossed with a homemade wing sauce. The ranch cream cheese layer in the middle can be adapted to suit any situation; Blue cheese ranch, blue cheese mouse, chipotle ranch and the list continues. We served the torte with fried spinach and sun dried tomato flour tortilla wedges. They added color, flavor and a creative twist on the classic corn tortilla chips. Speaking of twists…. Presenting our Buffalo Chicken Wrap with a ranch and blue cheese spread, buffalo chicken tenders, lettuce, carrot and celery. The concept was simple, take every element that makes your buffalo wing experience and pack it all into one compact bite. The moist chicken is the perfect vehicle for the spicy and tangy sauce, the celery and carrots provide a clean and crisp crunch while the ranch spread cools your mouth from the heat of the sauce. A perfect buffalo wing experience and no small bones to fight over! But wings are the standard, what is our new direction? Well since you asked, we decided to keep with the wrap direction and create a pair of Asian wraps perfect for any occasions. For your pleasure we offer our take on a Mexican rice and bean wrap and called it “south west sushi”! We used a bright and flavorful jasmine rice salad mixed with fresh; healthy, edamame. The secret to this amazing salad is in the dressing, we toss the rice with diced orange, shredded napa cabbage, mint, cilantro, chives, rice wine vinegar, sesame oil, orange juice and the secret kicker…. Pickled ginger. Every bite is a burst of fresh and exciting flavors dancing on your tongue. While we are dabbling in Asia why not experience our new Grilled Sesame Chicken Wrap! We marinated tender strips of chicken breast meat with chilies, garlic, sesame oil, toasted black and white sesame seeds, green onions, honey, and cilantro and lime juice. After a few hour soak, the strips then hit the grill for some char and sweet caramelization from the marinade. Our wrap was completed with fresh cucumbers, carrots, lettuce and a sweet and spicy Thai mayonnaise. The end result was a blast of fresh and bright flavors reminiscent of sweet and spicy lettuce wraps, without all the mess! So for your next game day, graduation or Thursday for that matter, step outside the wing and experience some Inspired creations! Stay tuned for more inspired dishes from Lon Lane's Inspired Occasions Research and Development Department! Touchdown!